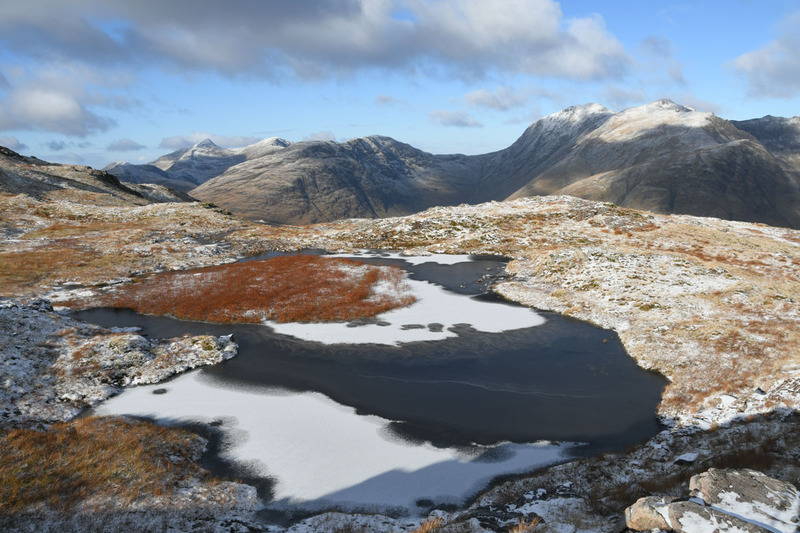 A decent looking weekend on offer – with the windspeeds not set to fall til sometime on Sunday morning we decided 2 daywalks would be better than a high camp. Saturday’s windspeeds were supposed to be fairly blustery and very cold. 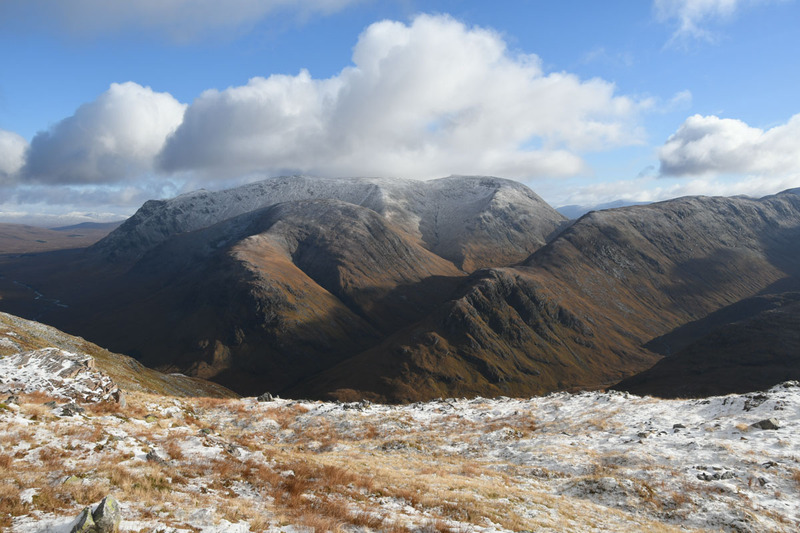 After a lot of swithering on Friday night (and on into Saturday morning) we decided to revisit Stob Dubh in Glen Etive. 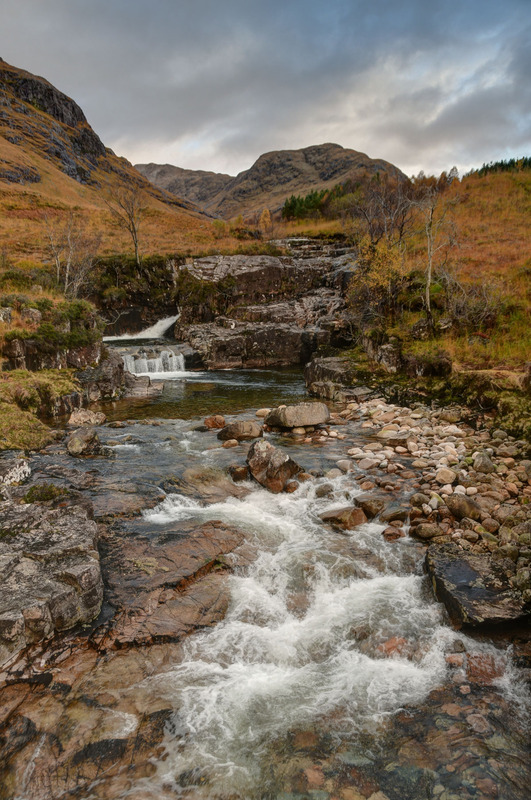 We’ve twice been up this one from Alltchaorunn, the first time in October 2010 it was full on spate conditions and we had limited views. A revisit in November 2013 was supposed to put that to rights but was once again clagged. Third time lucky perhaps. 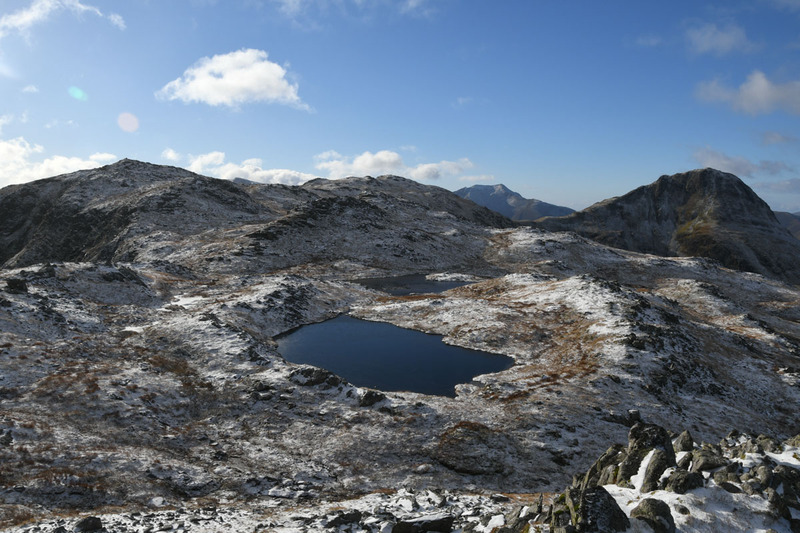 We didn’t get up too early – a relatively short walk and a forecast suggesting a better afternoon. 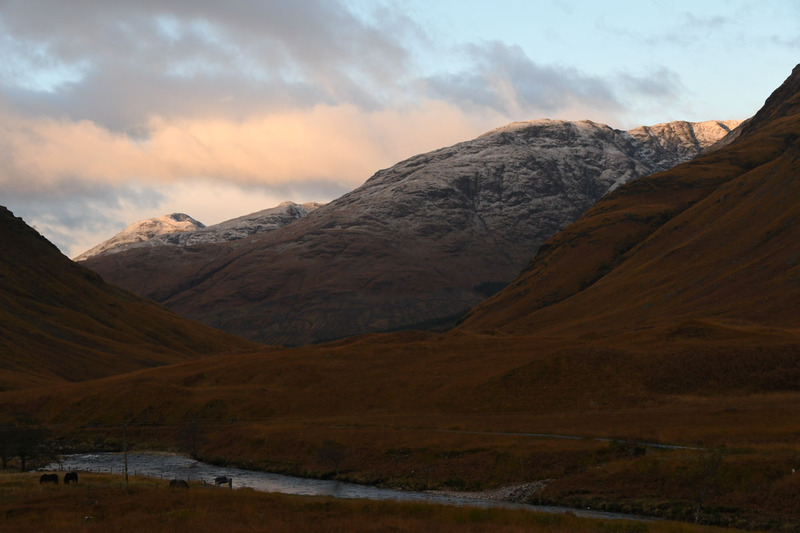 Parked at Alltchaorunn and got going just as the sun was lighting the hilltops. 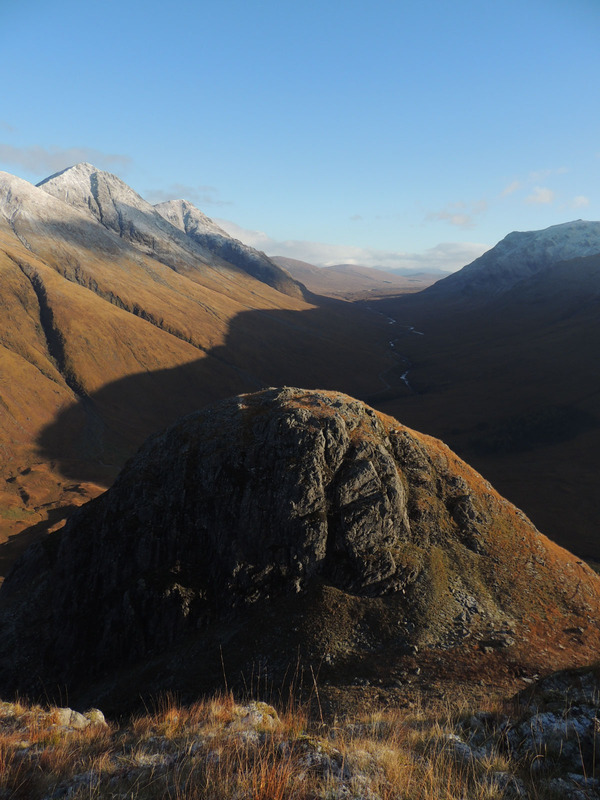 Glen Etive does not get much sun to the glen floor in winter. 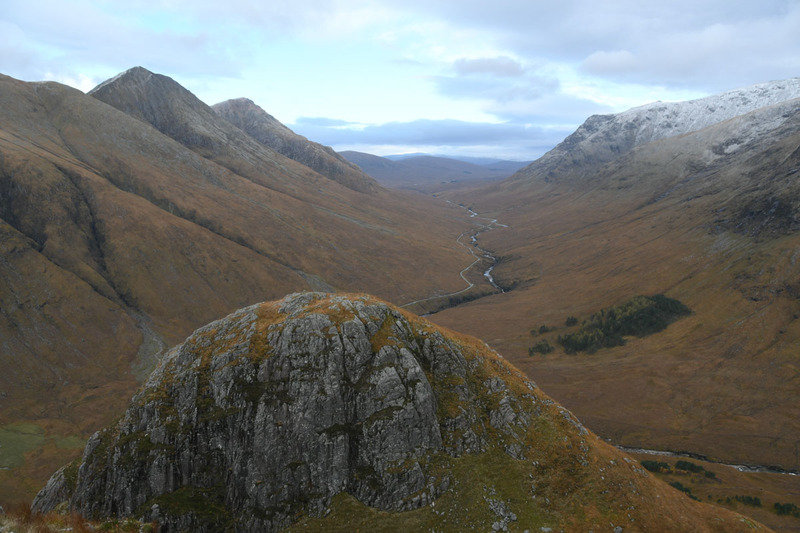 A nice view down the glen to Beinn Maol Chaluim and Beinn Fionnlaidh. Crossed the bypass path to avoid the cottage – the stile crossing has mulched to deep bog now. Saw a couple of redwings – trilling calls quite recognisable. 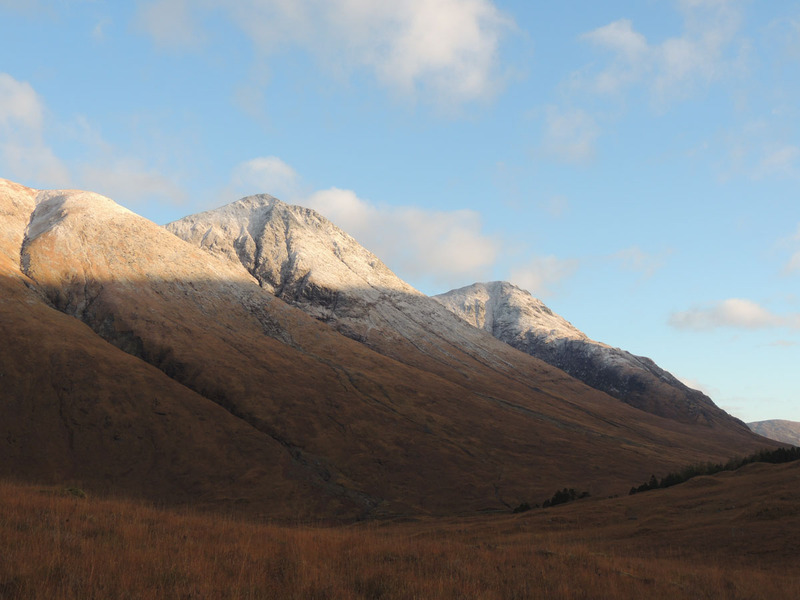 Above us the sun was lighting Stob na Doire and Stob Dearg. Used the bridge at the back of the cottage to cross the Allt a Chaorainn and followed the ATV track southwards to exit the fence at a gate at NN 196 502. Headed direct uphill towards An Grianan from there. 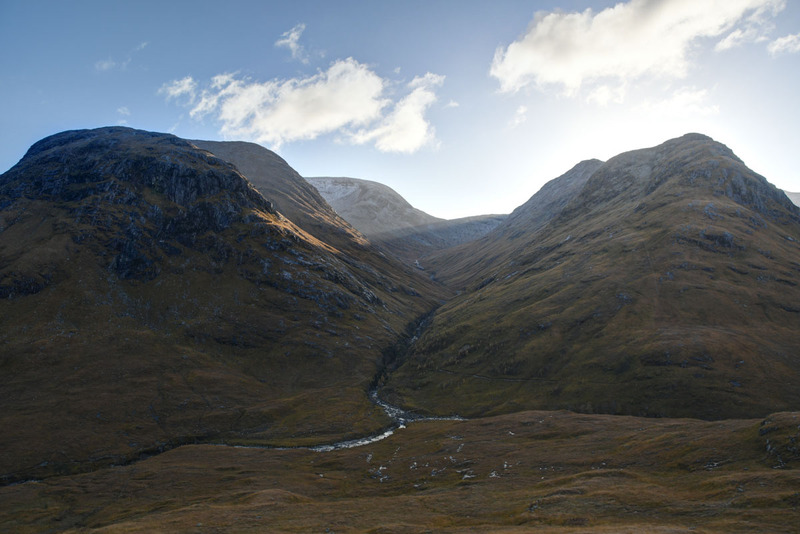 The view SW along the glen looks to Stob Coir an Albannaich, looking fine in the early sun. 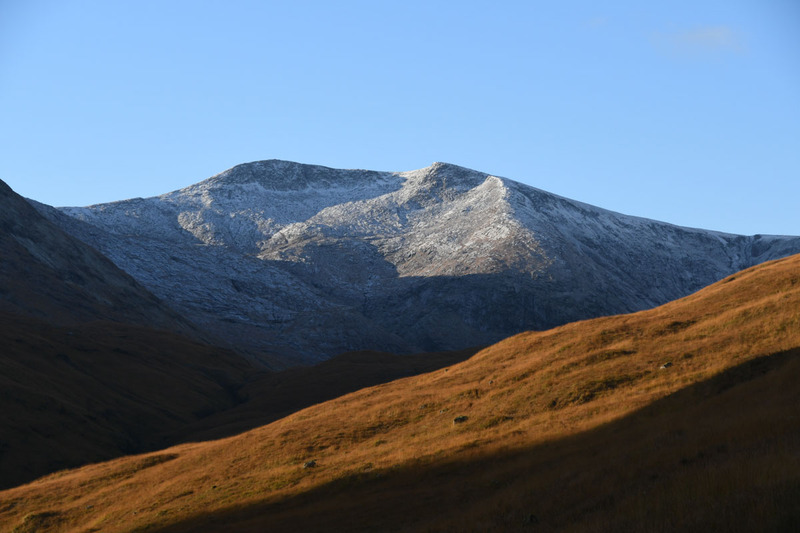 To the south is some very characterful terrain – the Black Mount complex of Beinn Mhic Chasgaig, Creise/Meall a Bhuiridh and Stob Ghabhar. 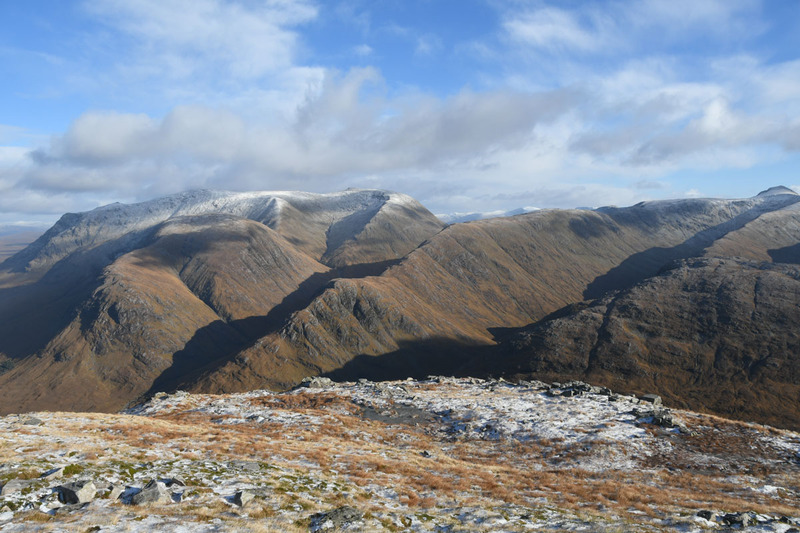 Beinn Ceitlein has a view into the NW arms and coires of the complex (the Aonach Mor ridge is a very nice approach to Stob Ghabhar). 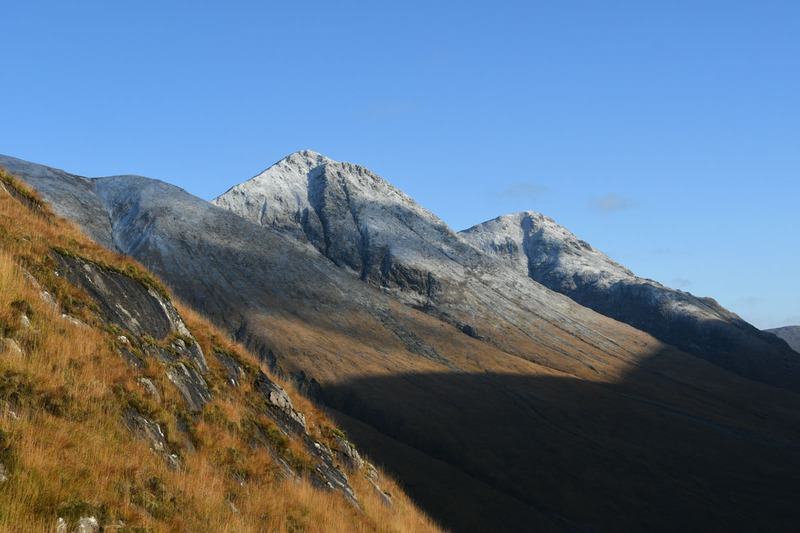 The tops of the Buachaille Etive Mor were looking nice in the sunshine. It’s a steep climb on reasonable terrain up to An Grianan. Surprisingly the morning was quite still and hot in the sunshine. The little nubbin of An Grianan had caught our attention many times before – went up it the last couple of times. The shadow of An Grianan is sometimes seen better than the feature itself. Decided to consider climbing An Grianan on the return when the glen was likely to be better lit. 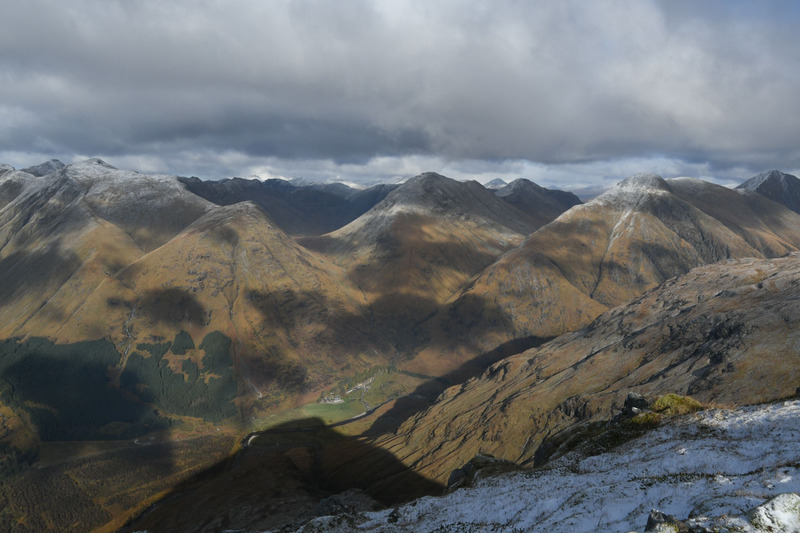 Heard and saw a couple of flocks of fieldfares heading past as we admired the views. 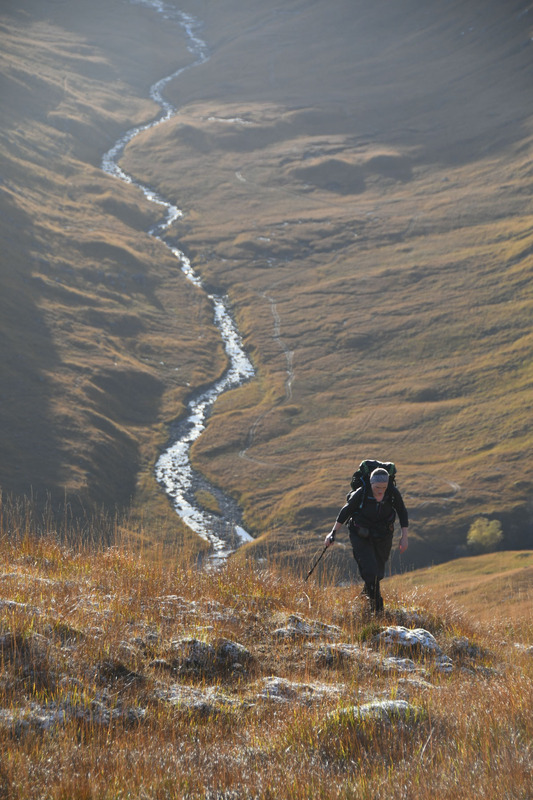 From An Grianan there’s a few hundred metres of gentle ascent before the traverse along the bobbly Beinn Ceitlein. Great views all round. 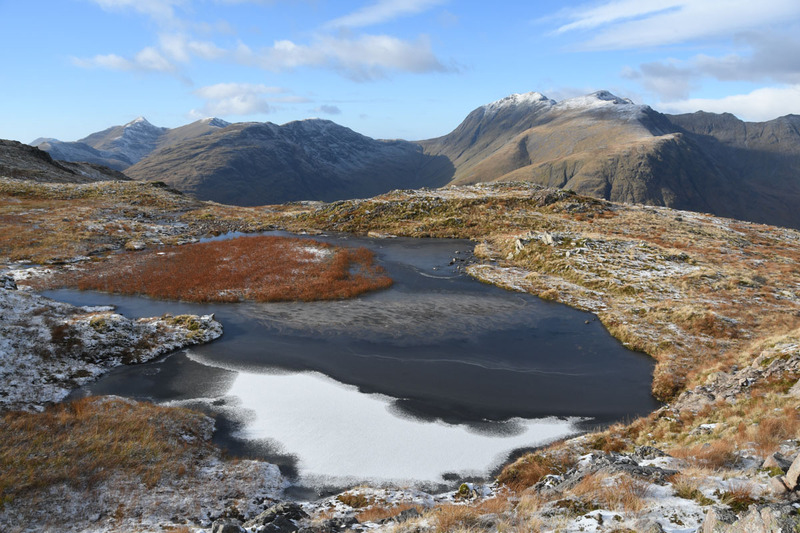 A rather striking pool with snow and russet remains of this year’s vegetation caught our eye – the dragonflies of next summer are asleep in there. Nice to be wandering in a little snow again. Here and there we could see hare tracks (although the animals themselves were not visible). 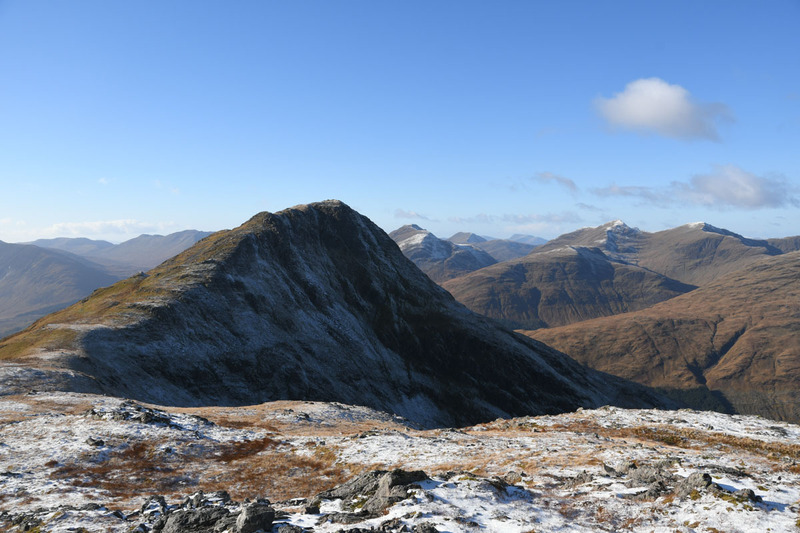 Once above 800m there’s a bobbly traverse along Beinn Ceitlein and a better view of what is ahead. 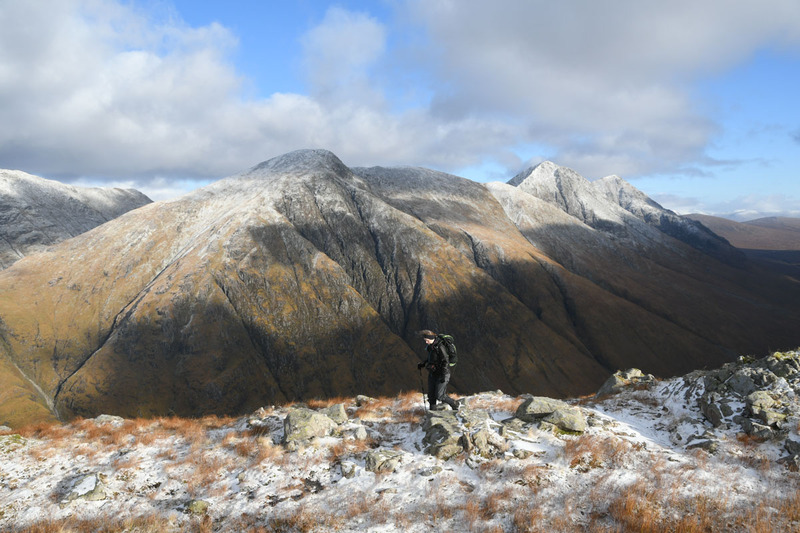 Behind us the shapes of the Black Mount complex are teased out with the Corbett Beinn Mhic Chasgaig folded in the embrace of Creise. 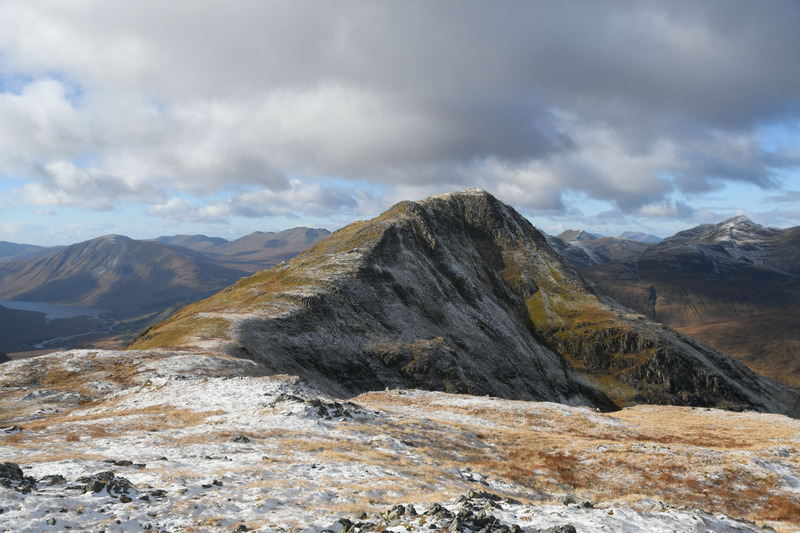 There’s a short descent from Beinn Ceitlein before Stob Dubh, 120m climb to the Corbett summit. 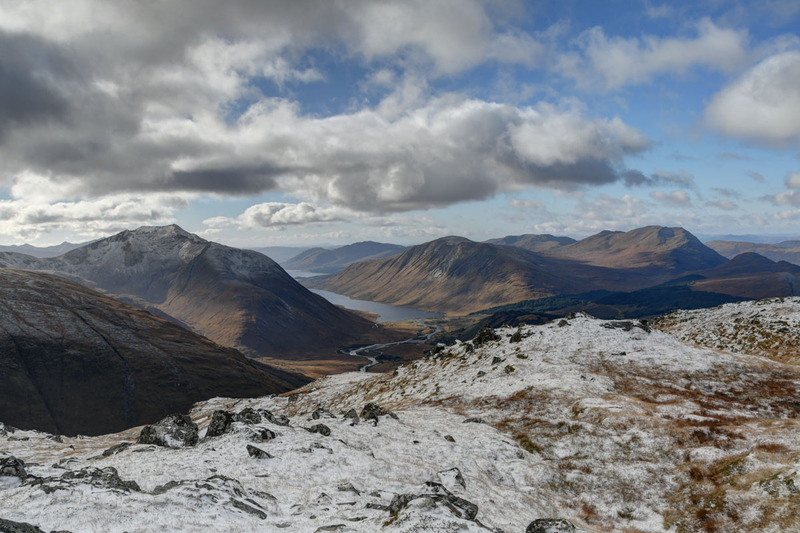 Once down to the bealach the view to Loch Etive opens up a little. 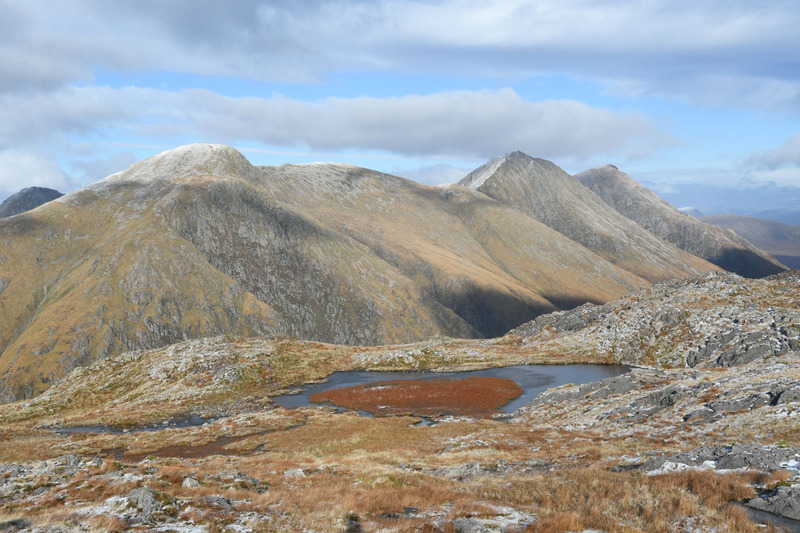 Ben Starav, Beinn Trilleachan and Beinn Sgulaird are prominent, Scarba was visible in the distance. Up to the summit and stuck on all the insulating gear. The windspeed was getting up and the air was Baltic. At the third time of asking the views were great though. 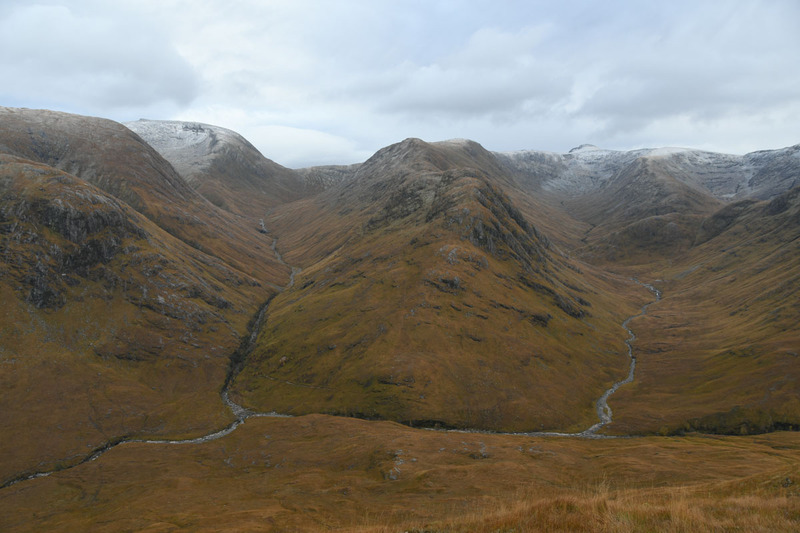 The big house at Dalness was deep in the glen below us. 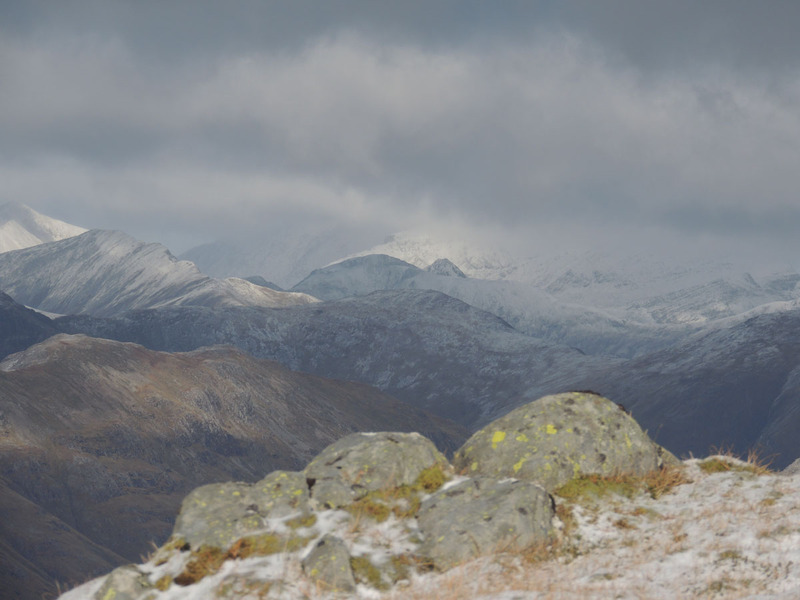 To the N Lochaber seemed cloudier – we got little glimpses of the Mamores. An Gharbhanach peeking up I think. 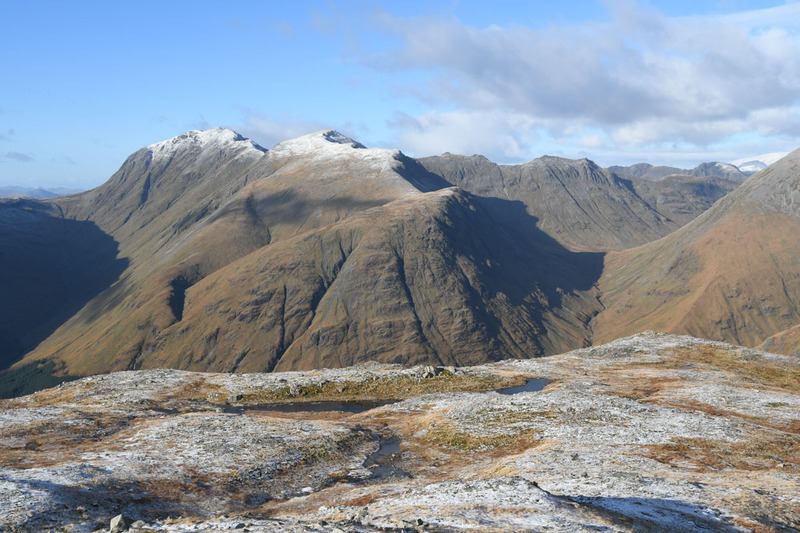 Hung around and enjoyed the views until numb fingers persuaded us that it was time to go. Headed back by the route of approach. 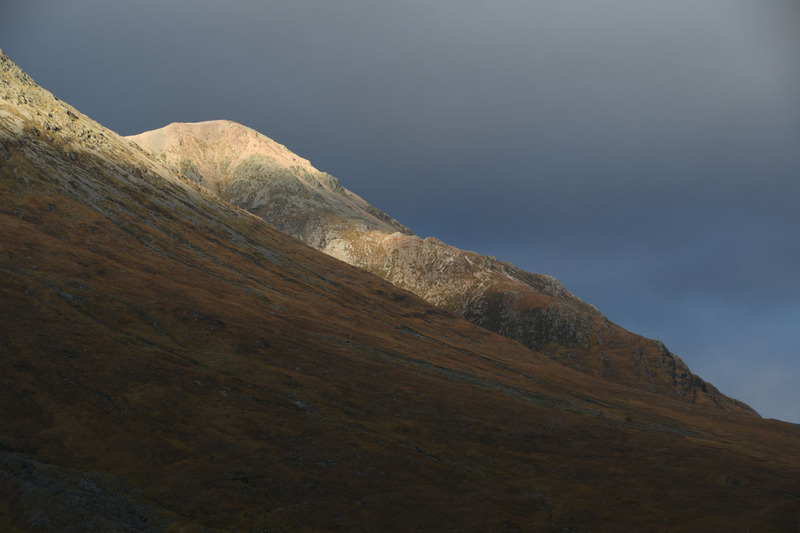 The light had shifted round a little and the cloud moved here and there obscuring this hill and that. We ambled along with no real need to hurry. 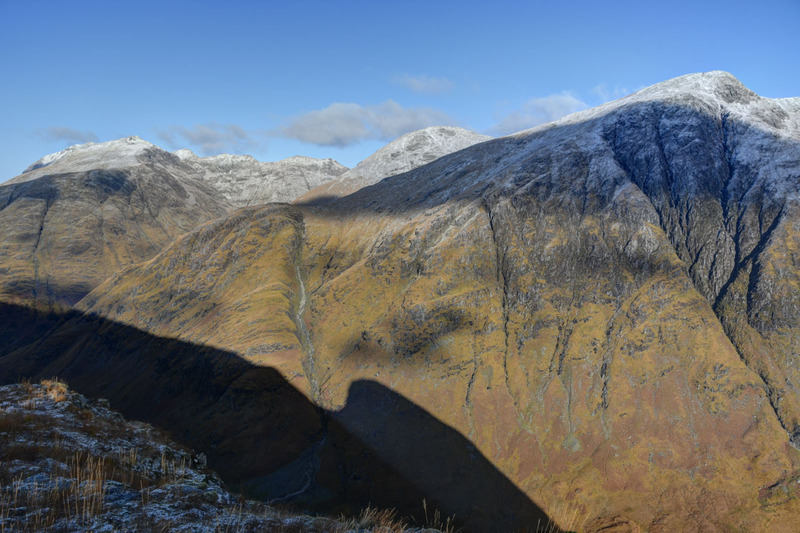 Bidean has a different character from the Glen Etive side. 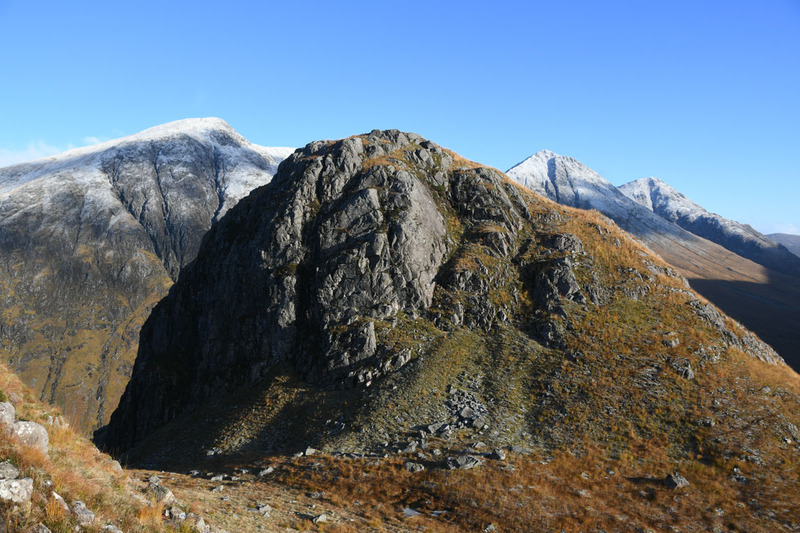 Haven’t spotted a decent route to tackle it from Etive though. The pool and its lovely vegetation distracted us on the way past. …and then it got a bit grey. Clouds obscured the sun as we headed down to An Grianan. Decided to leave it for another day. It’s a simple enough descent from An Grianan, plenty opportunity to ogle across at the arms of the Black Mount planning traverses and camping trips. 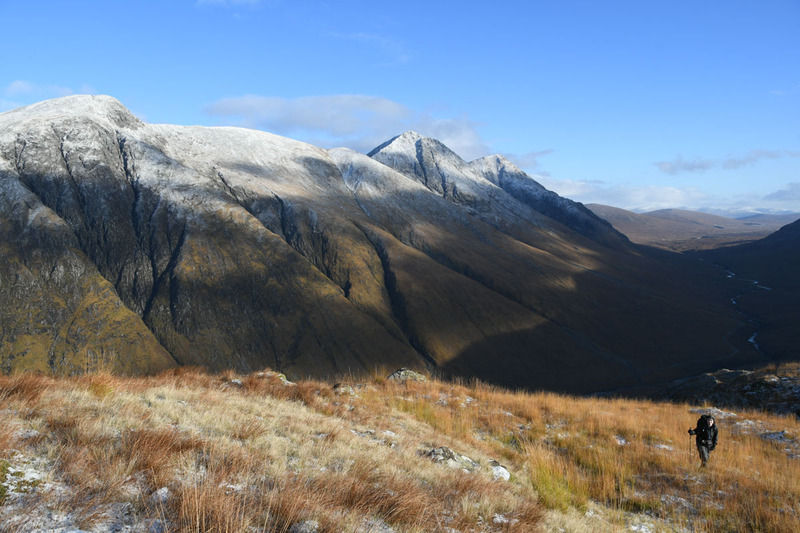 As we approached Alltchaorunn occasional sun patches lit Stob Dearg of Buachaille Etive Mor – showing why it was given that name. Across the bridge and then back to the car. 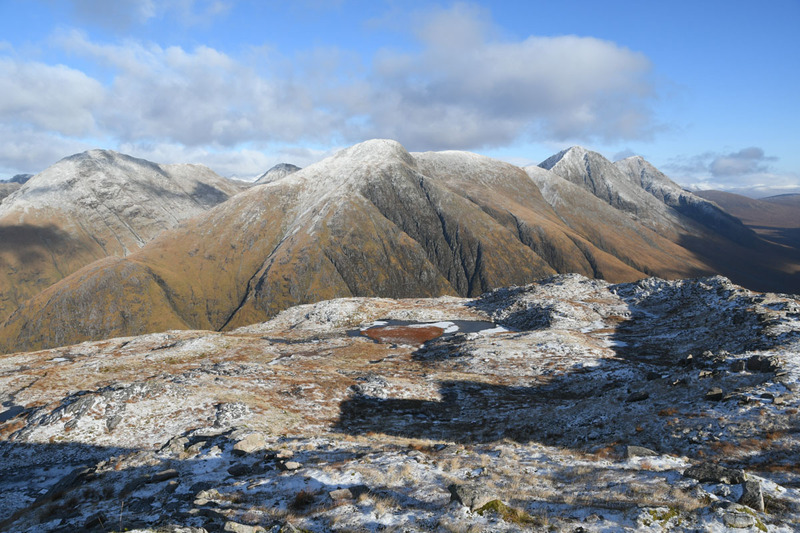 Great to finally get this Corbett climbed on a day worthy of its views. Even better the forecast for Sunday looked a belter.